The first time I stepped into an American supermarket I was gobsmacked. Firstly the trolleys were almost twice the size of our trolleys back home and similarly the aisles were wide and uncluttered (which is why shows like Guy’s Grocery Games don’t have contestants getting jammed into little corners or knocking down displays). And the sheer size of the produce was also astounding – giant heads of cabbage, cauliflower and broccoli that looked like they had been grown big in some mad scientist’s lab. The other thing that struck me was how cheap the meat was. Back in Singapore, a sea-locked island with practically no agriculture of our own, food is imported daily and subject to high shipping costs. It blew my mind that even at Thanksgiving, we could redeem a free turkey from the supermarket because we were regular customers. I remember it was my mother who first pointed out the fresh corned beef in the meat displays. Before that I had only seen corned beef in Libby’s tin cans and these preservative-laden processed can food was nothing like the real thing. She taught me how to make corned beef over the stove with patient and careful simmering with aromatics. My kids grew to love this tender and flavourful Sunday dinner treat with its no fuss cabbage and potatoes side dishes. Later when I got back to Singapore, I was disappointed to find that corned beef or silverside could not be easily found at the supermarket but only from some gourmet butchers which instantly made it too expensive except once in a while as a treat. So it was with sheer joy that I found cheap corned beef in Woolworths in Perth city; the meat was on offer (only $15!!!) and I managed to stuff it into my luggage back to Singapore (it helps to travel with cooler bags!). The first weekend after I got back, I happily popped the corned beef into the Instant Pot. 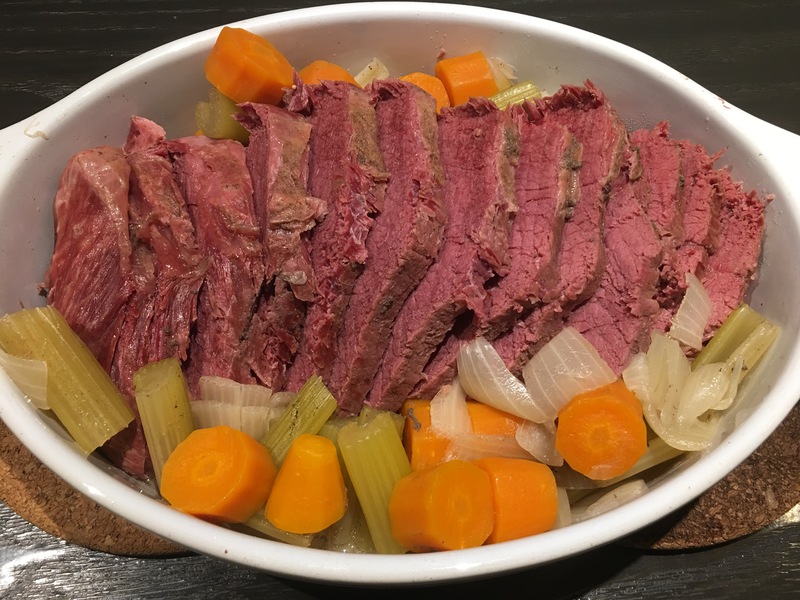 I used to do a slow cooker version of corned beef, but it made a lot of sense to have it done in the Instant Pot to cut down the long cooking time this meat cut usually needs. I found the Instant Pot version just as good as the slow cooker version of corned beef. In fact, I liked that I could still cut the cooked beef without it falling into shreds of meat. 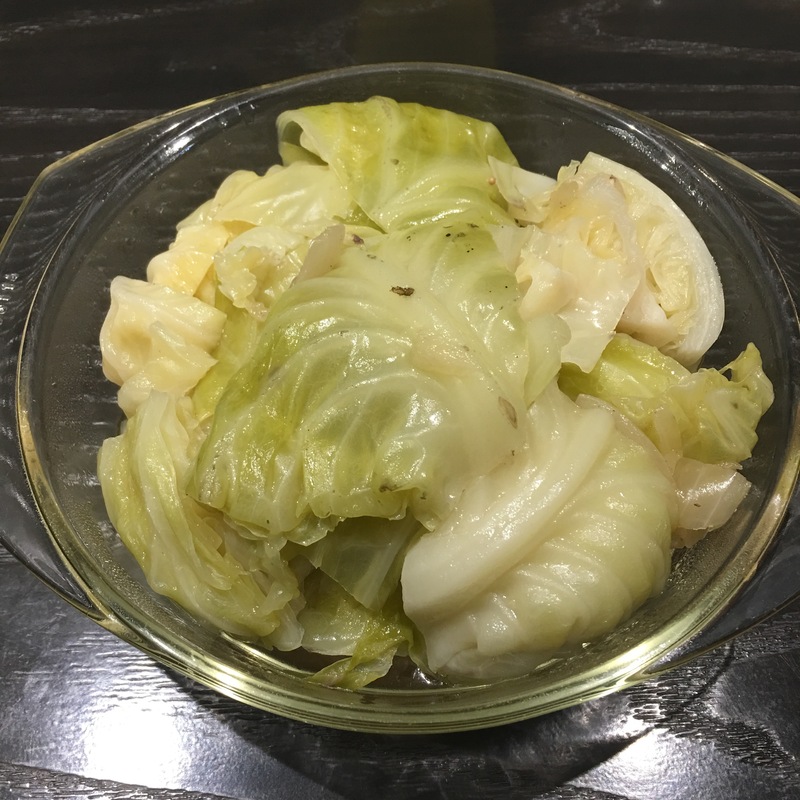 After pressure cooking the meat, the cabbage can also be pressure cooked in the cooking liquid, making this a truly one-pot meal. Put the peppercorns, mustard seeds and cloves into a spice bag. Place the beef into the inner pot and distribute the cut vegetables around the meat. Add water till the meat is covered. Add the spice bag as well as the bay leaves and dried thyme. Close the pot and put the valve in the sealed position. Pressure cook on manual function for 90 minutes. Allow normal pressure release. Remove the beef from the pot and slice. Put the slices of beef in a large serving dish and arrange the carrots and celery around the meat. Put the quartered cabbage into the pot. Seal valve. Pressure cook on manual function for 3 minutes. When done, do a quick pressure release and remove the cabbage and put into another serving dish, trying to keep the cabbage still in its neat quarters. Serve hot with horseradish or mustard.